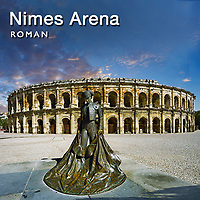 The Roman amphitheatre of Nimes was built around 70 AD. It is an oval amphitheatre measuring 133 m long and 101 m wide. Its two floors are supported by two rows of 60 arches on top of each other with seating inside for about 24,000 spectators on 34 rows of terraces. As with all Roman amphitheatres each division of the arena was accessed by its own flight of stairs which mad access very easy and fast . The open design and pitch of the seating also ensured an uninterrupted view of the arena. Underground floors beneath the Area allowed easy acess for animals and gladiators via stairs and lifts. The audience was protected from animal attack by a high wall that encircled the arena. As the Roman Empire declined in the 6th century AD, Visigoths started conquering Roman territory. When they took Nimes they fortified the Amphitheatre but the turbulent history of the early middle ages saw the collapse of the Visigoths as Muslims invaded present day Spain and south of France. 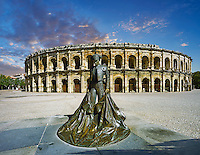 By the Mid 8th century the early Kings of France had recovered the south of France and the Viscounts of Nimes constructed a fortified Palace inside the amphitheatre. A small neighbourhood of Nimes developed in the amphitheatre and the building was occupied until the 18th century when it was restored as an arena.